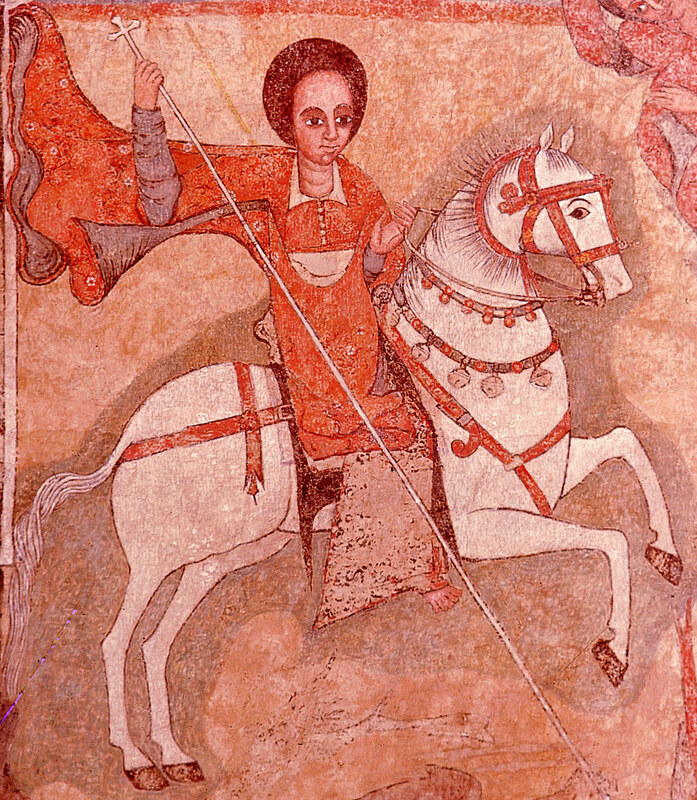 A larger image of an Ethiopian (Abyssinian) St George mounted on a white horse slays the dragon. Detail of a wall painting. St George mounted on a white horse slays the dragon. Place of Origin: Gondar church. Credit Line: Werner Forman Archive. Debre Berhan Selassie Church is the best known of the churches of Gondar for its interior paintings. It avoided destruction by the Mahdists in 1888. St. George is the patron saint of Ethiopia so he is a regular figure in religious art. His damsel, Brutawit, is usually seen hiding up a tree while George kills the beast. Brutawit’s father had sent her as a sacrifice to the monster.